Recém mobilados; novos tapetes e piso frio. Condição imaculada. Home está bem localizado para entrada bloqueada e caixas de correio. Não há animais de estimação, por favor. O lanai tem vista para a água com duas fontes de luz. O clube, piscina aquecida e sala de ginástica estão a poucos metros de distância. Encantadora trilha ao redor da água. Existem dois lugares de estacionamento reservados Imediatamente em frente da entrada. Perto de shoppings e restaurantes e UTC (University Town Center) um novo centro comercial de luxo que é adjacente a um grande complexo de remo que hospeda campeonato Divisão I, II, III competição. Toda a área circundante é segura e bonita. Cabo, internet, wi-fi incluído. Turnkey inclui tudo o que alguém poderia precisar, incluindo toalhas de praia e cadeiras, refrigerador, grade Foreman, máquina de lavar e secar roupa de capacidade total. Cada quarto tem uma cama queen size, seu próprio banheiro e TV. Grandes armários walk-in. Colchão de ar disponível. O espaço total é 1164 pés quadrados, 13 quilômetros de Siesta Key Beach. 2. 5 milhas da I-75. Sarasota / Bradenton International Airport fica a poucos minutos de distância. O pitoresco e bonito centro de Sarasota Area é de apenas 7 milhas de distância. Adorável Shopping, restaurantes, entretenimento, semanal mercado ao ar livre no centro com uma quantidade abundante de frutas frescas, legumes, produtos de padaria, etc. Curta caminhada para Marina Jacks, onde há passeios turísticos de golfinhos e cruzeiros do por do sol. Lovely, well equipped house, in a quiet neighbourhood within walking distance (15-20 minutes) of shops and restaurants @ University Town Centre. We really enjoyed our stay and would recommend to others. Thank you for your many kind words. I also love the location as it is wonderful to walk to many stores, restaurants and bars. You were wonderful guests and I would enjoy having you rent my home for another vacation in the future. Our two week stay here in Carolina Landings couldn't have been better. A nice pool within a very short walk topped everything off. Our unit was well equipped with everything we needed and having a few bonus items such as coffee (and filters!) was a nice touch. The owner (Christine) always responded quickly to any emails I sent (which were few) and issues such as how to exit the pool area (were quickly answered) even though the exit buttons were well posted which I obviously missed! If we decide next year to return to the Sarasota area, this will be our first choice. Thank you, Rick for your many kind words. I am always hopeful my guests are enjoying their stay and no one is wanting for anything. It was a pleasure having you all there and I hope you will again choose my home for another vacation in the future. We rented this property for 3 weeks and were totally satisfied with the accommodations. The inside of the condo was spotless. We loved the paintings the owner chose for all of the rooms. 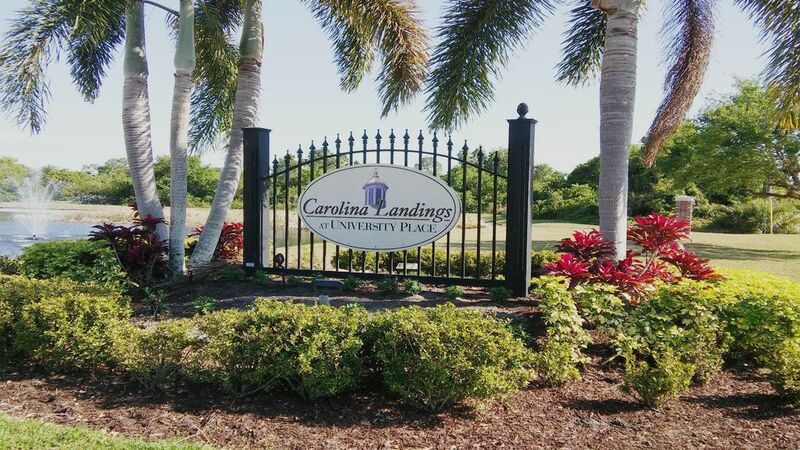 The location in Carolina Landings is one of the best in the community. It is on the lake, near the front gate and overlooks the pool. Also the morning sun shines directly on the patio so you can enjoy its rising and warmth over your morning coffee. The only negative, which was very minor, was that the floor tile on the patio had what appeared to be silt on the outer row of tile. We took the owners request that we treat her home as if it were ours and scrubbed it and removed all of the silt in short order. Also, as I explained to the owner, there is a wasp nest in the center screened roof support at the outer connection between it and the outer vertical wall. It is active but did not cause us any discomfort or harm but could be eliminated with a small amount of white silicone caulk. There is a tube of that caulk in the cleaning closet. Our stay was very enjoyable and we may want to lease it in the future. Thank you for your many kinds words and for making me aware of the lanai situation and the bees nest. Since I talked with you my property manager sealed the nest and the lanai/patio is all clean the same as the inside. You were wonderful guests and I would look forward to renting to you and Judy again in the future. Thank you, too for taking such good care of my home. Really enjoyed our stay in Carolina Landings. Lovely house with everything you need for a fantastic vacation. Only yards from a wonderful pool. Great location in an area that is very quiet and peaceful, yet you are minutes from a vast array of restaurants, shops and entertainment. Christine is a great host, keeping in touch but never intrusive. Had no problems at all and would return tomorrow (if only). If you want somewhere that is quiet and relaxing this is the place to be. We stayed for 3 weeks in sept,2018and spent most of the time by the heated pool. Shopping is close at hand and golf courses nearby at very reasonable fees also the staff at the Meadows Golf Club could not have been more friendly and helpful. Thank you for your many kinds words. I really like making my home your "home away from home." Thank you, too for being such wonderful guests. I am confident of future guests enjoying their stay as much as you and your wife did. Our stay was wonderful clean welcoming and had all the things we needed. Owner was amazing and worked with us on arriving and leaving. I would recommend to anyone coming to the area. Thank you for your kind review and for taking such good care of my home. You were wonderful guests. Menos de uma milha do Pavilhão da Comunidade Beautiful University Park e quadras de tênis. Deve ver Shelby Gardens; Museu Ringling; VanWezel Performing Arts; Passeios de barco com golfinhos; Cruzeiros do por do sol; Antique Car Museum; St Armand Circle; Teatro ao vivo; 23 Mi da bela Veneza e muito mais.